The Residences at The Ritz-Carlton, Dove Mountain is located 25 minutes north of downtown Tucson, Arizona within the Dove Mountain luxury real estate community in Marana. The community offers 16 exclusive homesites and 91 customizable residences in Phase I. Homes range from 1,668 to 5,460 square-feet with prices beginning in the high $600k’s. At Dove Mountain, acquire one-of-a-kind real estate property and surround yourself 6,200 acres of a natural desert oasis. And take advantage of resort amenities and our Jack Nicklaus golf course. At The Residences at The Ritz-Carlton, Dove Mountain there is plenty of beauty and serene areas to explore right outside your door. The community borders the Tortolita Mountain Park, with 3,000 undisturbed acres for hiking, camping and horseback riding. As a resident of The Residences you’ll have access to all of this from your front door. Dove Mountain has superb weather for outdoor activities making it an ideal location to live if you enjoy all that Mother Nature has to offer. With numerous amounts of trails in the Tortolita Mountains you can take day hike after day hike, exploring new trails each time. Cross the terrain from Marana to Oro Valley, another suburb of Tucson for additional exploration. The views of the sky and the stars at night from both The Tortolita Mountains and your home at The Residences, Dove Mountain are like none other. The views from the homesites at The Residences are some of the best views Dove Mountain real estate has to offer. Of course there are The Tortolita Mountains, the surrounding areas and a residential favorite, the Jack Nicklaus signature golf course. 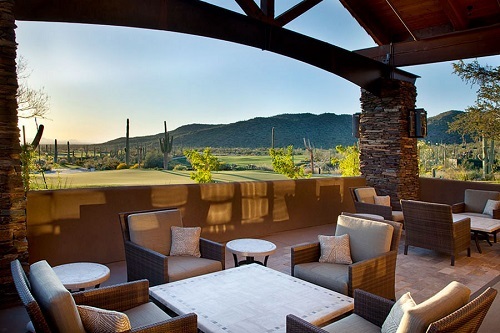 Arizona is known for great golf courses, and The Residences at The Ritz-Carlton, Dove Mountain is home to one of the best, which would be considered prime Dove Mountain golf course real estate. As a homeowner at The Residences you could have this incredible course right in your backyard – literally. This Jack Nicklaus signature golf course is also home to the Accenture Match Play Championship, held each year in February. On a day to day basis the golf course has a luxury golf club, which homeowners can become members of and take advantage of the amenities and all it has to offer. Dove Mountain real estate offers homeowners much more than a home. The community at The Residences gives homeowners the luxuries of resort living, world renowned golf, amazing views, unlimited access to outdoor activities and tranquil surroundings.